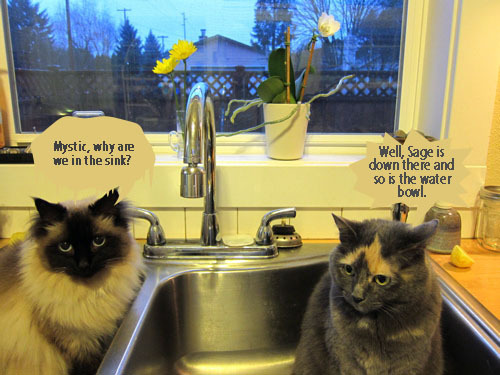 Hey, Sage! This is Mystic. I’m talking to you. Pay attention!! I’m taking over because you sometimes are a thorn in my side. Go chase a squirrel or something…. What? OK, OK! You can have the computer back in a minute. Just let me tell about Mango Minster 2011. 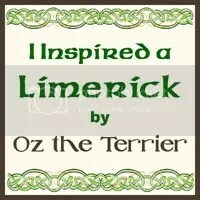 I’m entering in the Kitteh category and I hope I win! Then we’ll talk about who’s boss around here. Speaking of talking, I can tell you I sure do qualify for the Kitteh category. First, and foremost, I’m a CAT. Not a wimpy D-O-G (shhhhh, don’t tell Sage I said that). There is no way I listen when our Hu-mans call me. Even for dinner or (gasp) a bite of ham. I hear them but I come when I want to. I have them so trained they bring the ham to me. How about that, Sage? Usually I’m in my meditation mode, curled up in a ball contemplating my toenails. I can do that for hours. And hours. And hours. Probably 20 hours a day, but who’s counting? You ask what my favorite toys are? 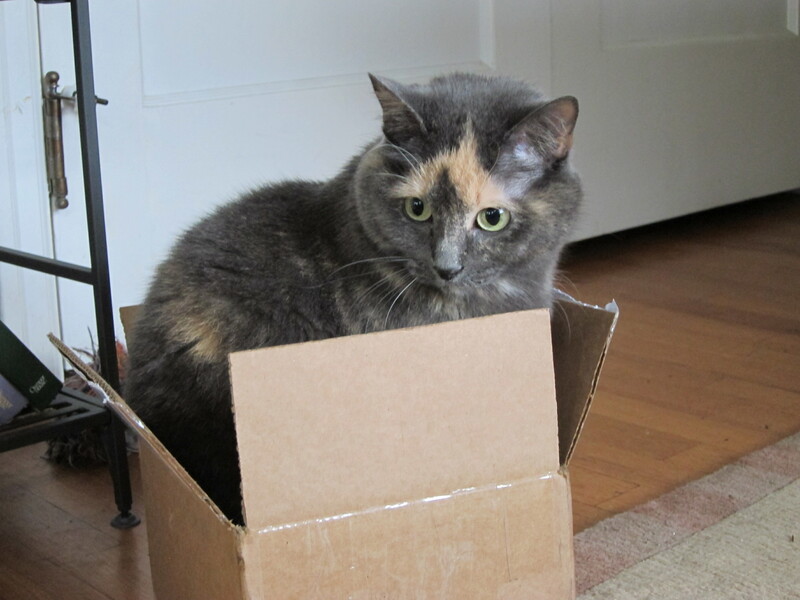 Well, give me a box anytime–none of that expensive cat nip infused mouse-looking stuff. And just let a fly get in my house. That requires acrobatics and skill to achieve the ultimate in torture. Then I sit back and watch my Hu-Mom finish it off with the fly swatter. One of the highest in Kitteh entertainment. But let me get on with my story. You probably know I have a sister named Thailing. She looks like a long-haired Siamese but I’m the one who talks the most–that’s why I’m telling this story. 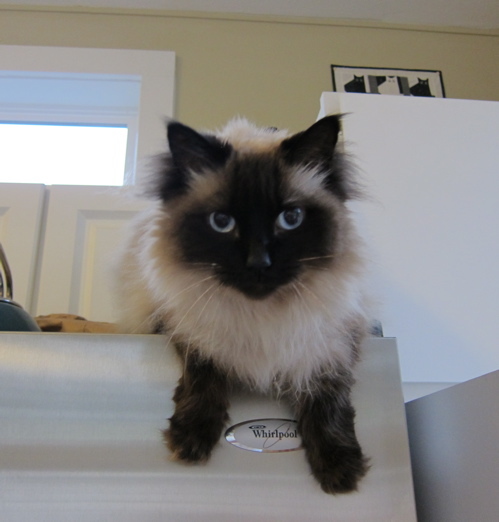 Thailing likes to hang out on top of the pantry–she stays away from Sage. Sometimes she hangs off the fridge–of course it’s all about treats for her. I think I need to give her some lessons on how to cope. Talk about coping! I have put up with a lot. 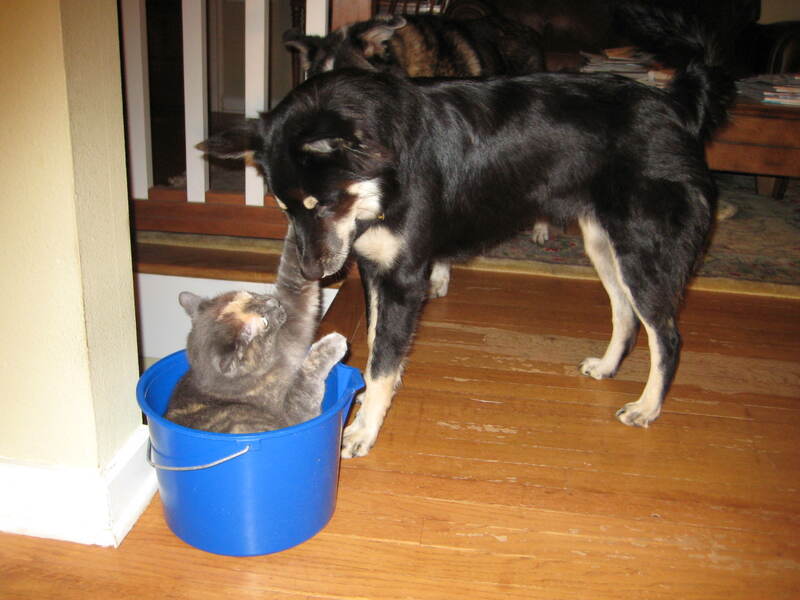 I can’t even enjoy a good bucket without Sage butting in. I do love getting into things, though. But, when Sage took over the cat tree condo, well, that was a huge event. Thailing and I started eviction procedures, but Sage’s attorney won. 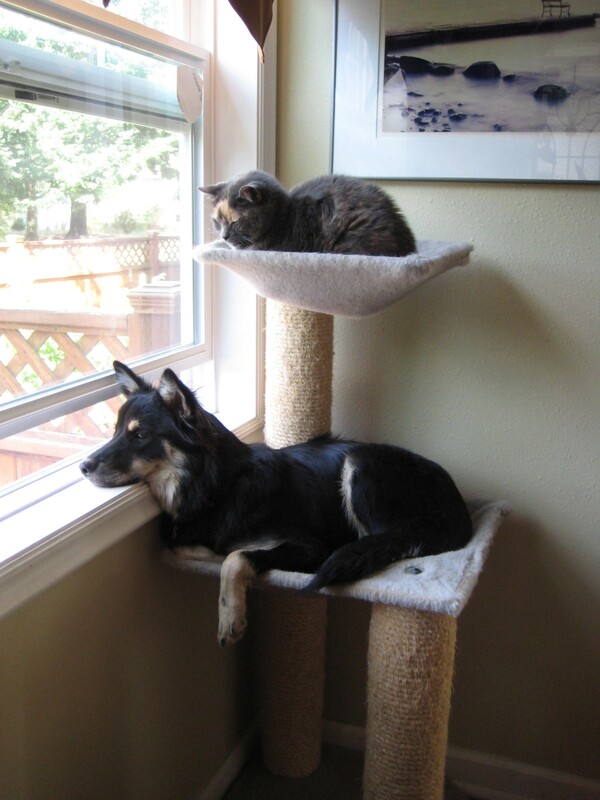 We had to compromise–Sage got the condo and we got the penthouse. I sometimes curl up the condo, though, when Sage isn’t looking! (Don’t tell her though). And then there was the sink incident. That was just the other day! So, that’s my story. Don’t feel sorry for us. We get the upper hand lots of times. I even think we are becoming friends! I go over and rub on Sage sometimes and she told me she secretly liked it. Hehe, little does she know…….